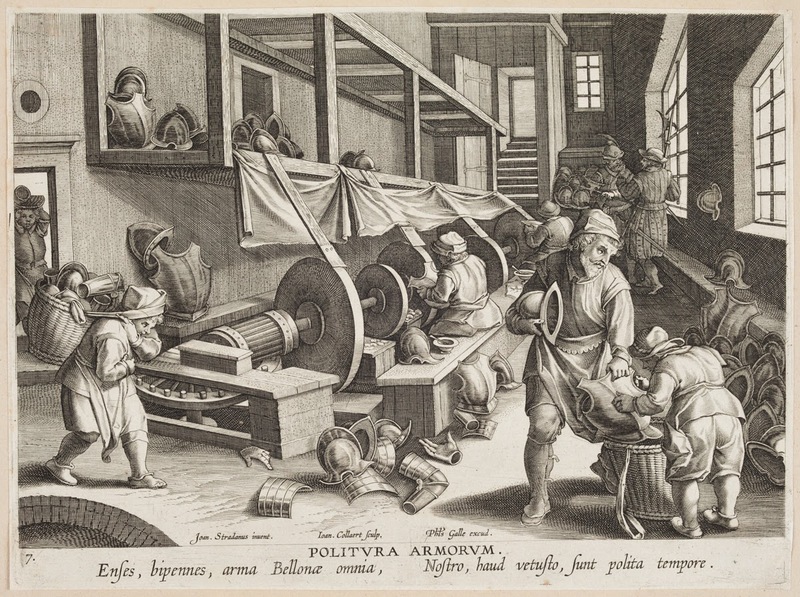 I’m delighted to report that the Museum has just acquired a first-edition copy of Politura Armorum (Polishing Armor), plate 17 from the series Nova Reperta (Modern Discoveries), dating to the 1580s. The series celebrates inventions and other discoveries made after the fall of ancient Rome, and its contents range from windmills and gunpowder to oil painting and stirrups. The designs were created by Jan van der Straet, a Netherlander who relocated to Italy to design tapestries and wall-paintings for wealthy clients (who knew him by his Latinized name Johannes Stradanus). Stradanus kept his professional contacts in Antwerp, sending copies of his designs to colleagues who could render them as copperplate engravings for the mass market. Today we imagine armor being made by a lone craftsman at his forge, but armormaking was actually an industrialized process by the 1500s. Polishing Armor shows water-powered grinding and polishing wheels, churning out mass-produced armor components for the ever-growing armies of the early modern age. The legend reads “Polishing Armor: Swords, axes, all the arms of war, are polished nowadays, but were not in Antiquity.” The print is one of surprisingly few realistic representations of the making of armor in the period, and therefore an excellent addition to the arms and armor of the Higgins collection.